Former Wales captain Sam Warburton. 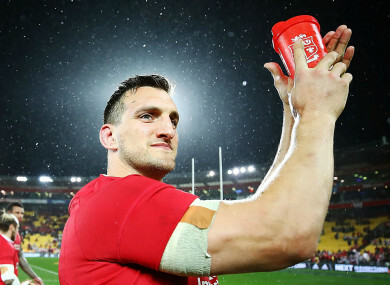 SAM WARBURTON HAS been overwhelmed by the support he has received after announcing his decision to retire from rugby. Warburton brought an end to his time in the sport yesterday, surprisingly hanging up his boots having previously been expected to return from injury to join Cardiff Blues for pre-season training. The flanker had been recovering from neck and knee surgery following his last international appearance for the British and Irish Lions against New Zealand in June 2017, but was not confident he could rediscover his best form. Warburton was capped 74 times by Wales and captained his country on a record 49 occasions, leading them to a Six Nations Grand Slam in 2012. He also captained the Lions for their 2013 series win over Australia and the 2017 drawn series with world champions New Zealand. The 29-year-old wrote on Twitter: “Never in a million years expected this much support. I cannot put into words how much it means to me. Email “Warburton overwhelmed by support following shock retirement announcement”. Feedback on “Warburton overwhelmed by support following shock retirement announcement”.